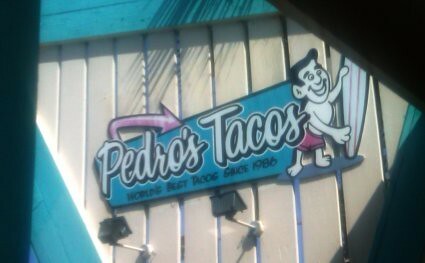 Shortly after starting this blog I was told by some friends that had moved out of state years earlier that they really liked a place in South Orange County called Pedro's Tacos. 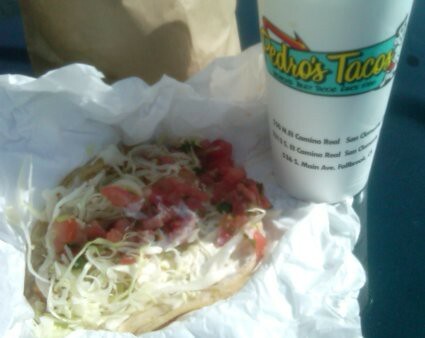 Not long after that I went to the Pedro's in San Juan Capistrano and figured I had found their prized food stop only to have it dawn on me that it wasn't the Pedro's I had been referred to. 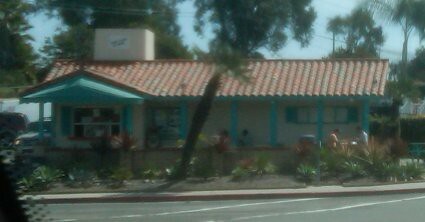 The Pedro's in San Juan Capistrano fits with the nearby mission theme while the Pedro's in San Clemente fits in with the surrounding surfer theme. In fact Pedro's surfer mascot looks like it could be buds with the Kanvas by Katin mascot. 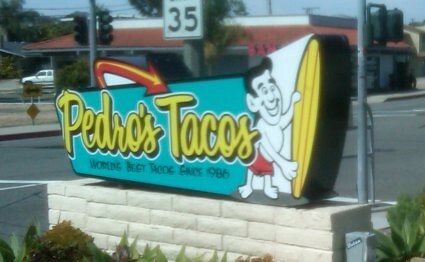 Now, there are two Pedro's in San Clemente (and one or two in San Diego County) and they are both on El Camino Real. One is considered the south one and one is considered the north one. I tried the north one first and was dismayed to find out that it's a drive thru and a walkup window only with no seating to be found. 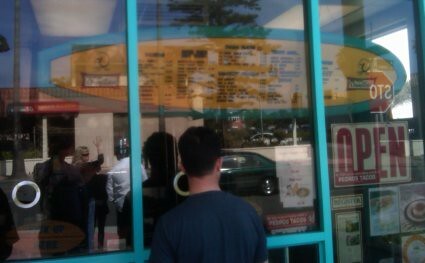 A lot of people were ordering their food at the window and taking it back to their car to eat it. But the food is messy so I ate mine on the hood of my car. It was also discouraging that the employees acted very disinterested and slightly annoyed that customers were showing up. Maybe I caught them at the wrong time. I try to give people the benefit of the doubt and try not to assume that their behavior in one encounter is what they are always like. And I tend to be more concerned about food quality than service so no biggie. On this visit I got a fish taco, a carne asada taco, and their much lauded potato taco which is literally a taco with a fried hash brown in it, just like the kind I used to fry up when I worked at Jack in the Box before the clown was put back in charge, the kind that's shaped like a rectangle with slightly rounded corners. 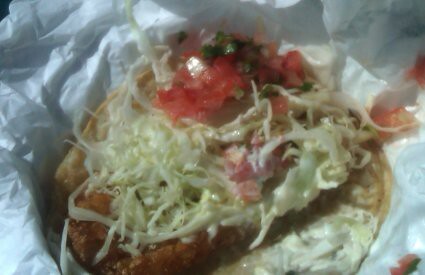 The fish taco and the potato taco come with cabbage and salsa and their dressing, similar to Del Taco's secret sauce. 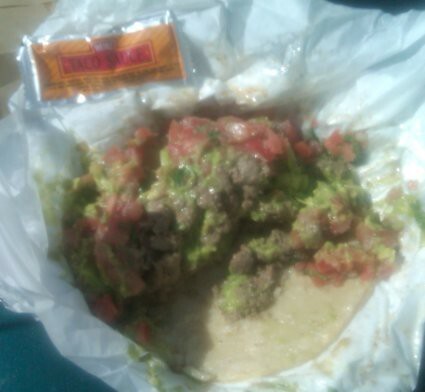 The carne asada taco comes with salsa and guacamole. All are served on a thick corn tortilla stuffed to the gills and almost overflowing then sort of wrapped and rolled into foil. I think I would've been fine with just two tacos. All were at least serviceable; none were too memorable. Oh, and their Heinz hot sauce packets tasted just like old school Taco Bell hot sauce. Kind of nostalgic. Two days later I decided to try their south location. This spot actually has several outside tables, and employees that are slightly less blasé . . . but not much. This time I got their chicken quesadilla, which was more like a cross between a quesadilla and a burrito (going off of the unique way it was folded) and their taquitos, which they list on their menu as "rolled tacos" but all the customers just call them taquitos. Again I ordered too much food; the quesadilla is a meal in itself and the chicken chunks inside are huge. Oh, and there's some cheese (American?) and guacamole in there too. The three taquitos (might've come from Costco) had coagulated into one solid shape with their grated cheese and guacamole toppings gladly joining the party. 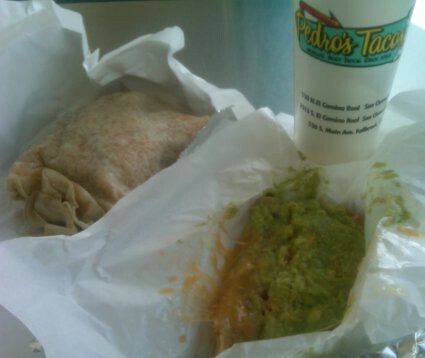 My take on Pedro's is: don't go out of your way to get there but if you're nearby and you're hungry then give it a shot. 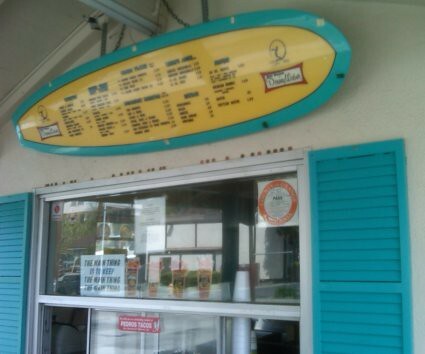 It's also pretty cool just to watch all the surf mobiles going through the drive thru for some grub. And if you try that fried chicken taco on their menu leave a comment and let me know what it was like. View the complete photo album (17 photos so far) at flickr.